Glasgowmusic.co.uk - Review : "DJ Format & Abdominal - Stereo - 04/05/17"
"Hip-hop legends unite for new album and tour, stopping off at Stereo." 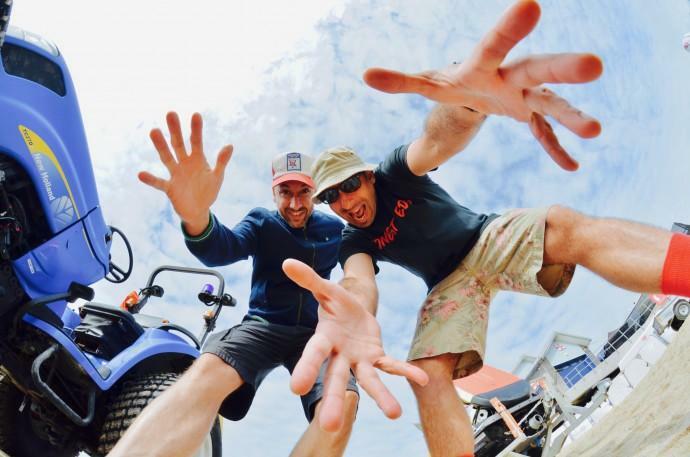 Despite having toured and collaborated together for almost fifteen years, it is somewhat surprising that it has taken this long for DJ Format and Abdominal to make a full-length album. Still Hungry, released earlier this year to widespread critical acclaim is a proper old-school hip-hop record. The duo arrive to perform at a mobbed Stereo on the second date of an extensive UK tour. After providing the beats to Andy Cooper from Ugly Duckling�s support slot, Format stays at his raised desk at the back of the stage as Abdominal joins him to launch into album highlight �Behind The Scenes�. The duo trade lines before a chorus straight from the concrete schoolyards of classic Jurassic 5. The brunt of the material this evening, as expected, comes from �Still Hungry�, however there is still room for the classics. Airings of �The Hit Song�, a remixed �Vicious Battle Raps� and a ferocious �Ill Culinary Behaviour� please the crowd who spit every lyric back, before Andy Cooper joins them onstage for a phenomenal cover of The Pharcyde�s �Passing Me By�. It is testament to the newer tracks that they do not sound out of place amongst the favourites. They stick to the same formula which led the duo to initial fame � funk-oriented beats backing playful rhymes � however there is more depth this time around, apparent on the likes of the bass-heavy �Dirt� and autobiographical �No Time� which is a refreshing take on the modern life of a rap artist who doesn�t brag about money and fancy cars. Abdominal�s flow is almost immaculate tonight. Even though he does lose his place during the political tirade of �White Rapper�, resulting in him having to start again, he more than makes up for it on the aptly-titled set closer �Breathe Later� in which he manages to cram an incredible amount of verses at speed before stopping for breath. After refusing to be let off the stage by an intimidating Glaswegian crowd demanding more, the duo perform an immense �Ugly Brother�, in which Abdominal take the opportunity to rip apart Format�s looks, and �Participation Prerequisite� in which every single person in Stereo hollers back the song title before being treated to an additional DJ set from Format while frontman Abdominal is eventually allowed to leave the stage to mass bear hugs. In an era where the genre is largely dominated by darker, politicised statement records from the likes of Kendrick Lamar, the duo have managed to deliver a refreshing reminder of how fun hip-hop can be, while still packing verbal punches. Format and Abdominal may be getting older, but on the basis of this evening�s performance, their relevance cannot be questioned. This review has been viewed 3781 times.